This is a killer fossil shark tooth. It is a huge Carcharocles megalodon shark tooth from North Carolina. 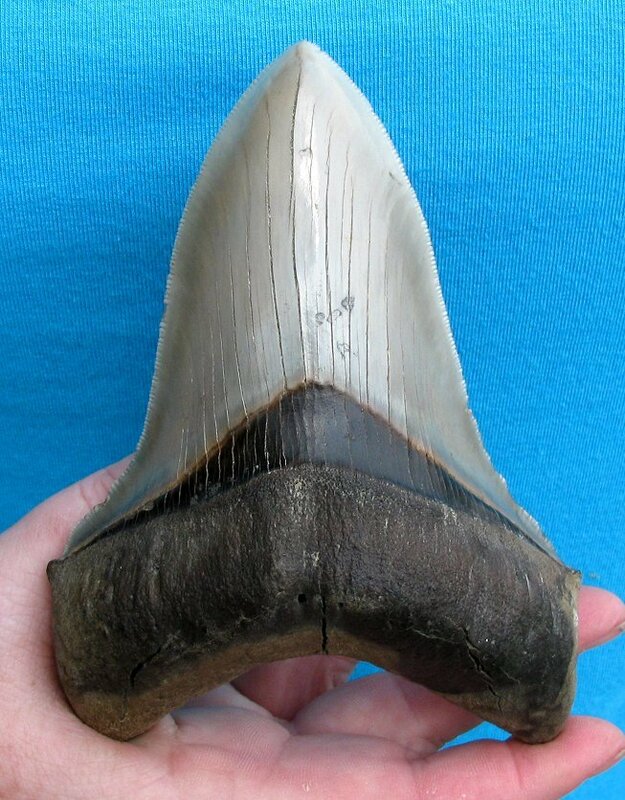 Megalodon teeth from North Carolina have become very scarce and extremely collectible, to say the least. The overall quality of this tooth is absolutely fabulous. The very tip is essentially intact and pointy, and the serrations are razor-sharp and beautifully displayed. The root is very solid and substantial and is extemely thick and robust. The classic blue-grey coloration of the enamel is wonderfully preserved - the tooth is simply beautiful. This is a very large, extremely collectible fossil shark tooth from the famous Lee Creek Mine in North Carolina that had been in a collection for years.